Staten Island Oral & Maxillofacial Surgery offers the most advanced treatment options to correct major and minor skeletal and dental deformities in the jaw. Jaws that are imbalanced or in the wrong position can lead to a number of problems that can affect chewing, swallowing, breathing, and overall facial appearance. Problems with jaw alignment can be caused by injury, birth defect, or different growth rates between the upper and lower jaws. Proper detection and treatment of jaw deformities can help manage chronic jaw pain, biting and chewing difficulties, or any other jaw related problems. Ultimately, techniques that bring the jaw and teeth into better balance can improve the functionality and health of your jaw. One of these techniques is referred to as distraction osteogenesis, which can help expand or stretch the jawbone to treat defects and deformities. While braces are often used to correct misaligned teeth, traditional orthodontic procedures are only effective when the problem involves the teeth alone. For some patients, tooth misalignment is caused by poor positioning of the jaw itself. 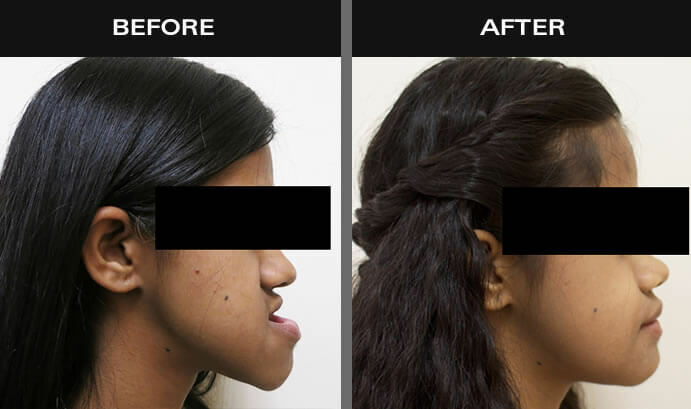 In these cases, orthognathic surgery is often necessary. The purpose of orthognathic surgery is to reposition a misaligned jaw to ensure that teeth meet properly and the jaw functions effectively. In addition to its functional purposes, orthognathic surgery can also help improve a patient’s appearance by correcting facial imbalances like a receding chin or protruding jaw. What are the symptoms of misaligned jaws? The correction of jaw deformities often requires a united effort between an oral surgeon and an orthodontist. When you visit Staten Island Oral & Maxillofacial Surgery, our oral surgeons will evaluate your condition to determine the right treatment option for your case. As with any condition, the exact treatment plan will depend on your specific condition. Typically, corrective jaw surgery includes the repositioning of all or part of your upper jaw, lower jaw, or chin. In addition to this procedure, an orthodontist may place braces on your teeth to move them into a better position. This may be done before or after your surgery. Can I see what my jaw will look like before I have my surgery? Staten Island Oral & Maxillofacial Surgery uses a sophisticated 3-D computer modeling system to show you how your corrective jaw surgery will proceed and what you can expect your face to look like once your surgery is completed. Our office provides patients with the latest imaging systems and computers to simulate orthognathic surgery. Utilizing CAT scans and patient photos as well as medical models, we can both diagnose and plan a patient’s individual surgery. By performing virtual surgery on computers, we can predict and simulate a patient’s surgery and obtain a general prediction of the surgical outcome. Both Dolphin and Quick Ceph imaging is available at our office. Our orthognathic surgeons will outline the details of the procedure and expected results using this imaging technology with you during your initial consultation. Distraction osteogenesis is a technique in orthognathic surgery that expands or stretches bone in the jaw. Simply stated, distraction osteogenesis means the slow movement apart of two bony segments which allows new bone to fill in the gap created by the bony segments. This technique was initially used to treat defects of the oral and facial region in 1990. Over the past two decades, surgical and technological advances in the field of distraction osteogenesis have provided oral and maxillofacial surgeons with a safe and predictable method to treat select deformities of the oral and facial skeleton. What is distraction osteogenesis in neonatal airways or pierre robin syndromes? Babies born with small jaws (micrognathia) and other congenital deformities can have airway problems at birth, sometimes so severe that they require immediate tracheostomies. Distraction devices can be placed that will elongate the mandible or lower jaw so that the babies can breathe normally and have the tracheostomy removed. This procedure is performed by our Pediatric airway team, which includes the neonatologist, pediatric ENT, and oral & maxillofacial surgeon. It normally takes between 2 to 3 weeks to allow sufficient growth before the tracheostomy is no longer necessary. Distraction osteogenesis in older patients that have skeletal facial deformities, such as cleft lip and palate patients, or severe jaw deformities can be used as well. These devices have made treating these patients significantly less complex, with a major reduction in operating time and hospitalization. The newly formed bone can serve as an excellent foundation for dental implants. How is distraction osteogenesis surgery performed? During distraction osteogenesis, the oral surgeons of Staten Island Oral & Maxillofacial Surgery will insert the distraction device inside the mouth. The device will stretch bone in the jaw. The entire surgery is performed within the mouth, so no facial surgical incisions are made and no unsightly facial scars will result. Distraction osteogenesis is usually performed under general anesthesia as an outpatient procedure. Because the procedure itself is minimally invasive, there is typically less pain and swelling than traditional surgical procedures for similar conditions. Most patients return home the same day of surgery. What can I expect after distraction osteogenesis surgery? Postoperatively, you’ll be given appropriate pain relievers to keep you comfortable, as well as antibiotics to fight off infection. Some mild discomfort may be felt when the distraction device is activated to slowly separate the bones. This discomfort is roughly comparable to having braces tightened. You’ll need to return to our office frequently during the initial two weeks after the surgery so that our oral surgeons can monitor you for infection and teach you how to activate the appliance. In some cases, a second minor office procedure may be necessary to remove the distraction device. How can I find out more about orthognathic surgery? For more information on orthognathic surgery, please contact Staten Island Oral & Maxillofacial Surgery to schedule an appointment with oral and maxillofacial surgeons David Hoffman, D.D.S., F.A.C.S., Lydia J. Lam, D.D.S., Steve Yusupov, D.D.S., M.D., and Mark Stein, D.D.S., M.D. at 718.226.1251.